Dishwashers/Glasswashers can be plumbed into either the hot or cold water supply, taking into account the maximum incoming water temperature recommended by the manufacturer. 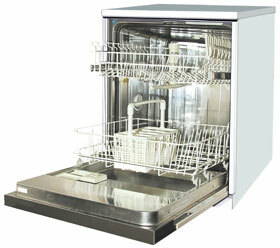 Plumbing a dishwasher/ Glasswashers into the hot or warm water supply can improve cleaning performance and reduce food debris in the interior of the dishwasher. A few dishwashers may spend much less time on the wash phase if the incoming water is hot, which can compromise cleaning, so results will vary. If the Dishwashers / Glasswashers have run out of the salt that recharges the ion exchange resin that softens the water, and the water supply is "hard", limescale deposits can appear on all items, but are especially visible on glassware. It can be removed by cleaning with vinegar or lemon juice, or a proprietary limescale removal agent. The dishwasher should either be recharged with salt, adjusted appropriately for the hardness of the supply water—or possibly this is a symptom of failure of the ion exchange resin in the water softener (which is one of the more expensive components). The resin may have stopped working because it has been poisoned by iron or manganese salts in the supply water. Do you live in a moderate or hard water area? If so, we’d recommend you use a water softener to get the best results from your glass washer and to protect against lime scale. Extras like these are all part of our service too and we’ll be happy to discuss the options with you. For instance, some glass washers come fitted with integral water softeners or you can add a manual water softener.